8 "Blue Homeland" exercises that made constant use of sonar and practised with live ammunition. With these giant exercises ... the strain is placed on the entire marine ecosystem, including fish and plankton, because (they) cause intense noise pollution from which marine life can't escape. Turkey did not immediately respond to requests for comment on the issue. After several mass beachings of whales, NATO, to which both Turkey and Greece belong. 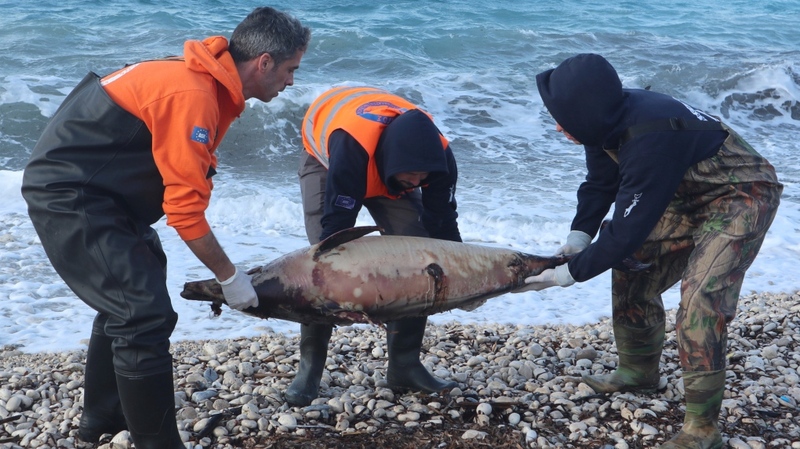 The Aegean Sea has seen a "very unusual" spike in dolphin deaths over the past few weeks, a Greek marine conservation group said Monday. The Archipelagos Institute said while it's still unclear what caused the deaths, the spike followed Turkey's largest-ever navy drills in the region - the Feb.
27-March 8 "Blue Homeland" exercises that made constant use of sonar and practised with live ammunition. Fifteen dead dolphins have washed up on the eastern island of Samos and other parts of Greece's Aegean coastline since late February, the group said. Its head of research, Anastassia Miliou, told The Associated Press that 15 is a worryingly high number compared to "one or two" in the same period last year. The deafening noise of sonar, used by warships to detect enemy submarines, can injure dolphins and whales, driving them to surface too fast or to beach themselves - with sometimes fatal consequences - as they try to escape the underwater din. "We can't say that the Turkish exercises killed the dolphins, but the fact that we had such an unusual increase in the number washed up dead - and what we have seen must be a small percentage of the total, because the Aegean has a long coastline - coincided with exercises that used more than 100 ships," Miliou said. After several mass beachings of whales, NATO, to which both Turkey and Greece belong, adopted a code of conduct for using sonar to better protect marine mammals. Miliou said the alliance's rules are respected by the U.S. Navy and the Greek navy but said it was unclear whether Turkey has implemented the guidelines. She urged the Greek government to raise the issue in talks with Ankara. "With these giant exercises ... the strain is placed on the entire marine ecosystem, including fish and plankton, because (they) cause intense noise pollution from which marine life can't escape," she said. Turkey did not immediately respond to requests for comment on the issue. Miliou also said the Aegean "can barely handle" other strains humans are putting on the sea, such as pollution, overfishing and heavy marine traffic.